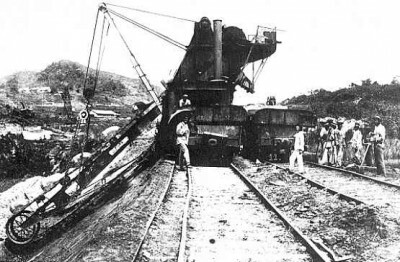 This photo is of a derailment at Bas Obispo in 1886- the French Railroad days. Note the Jamaican workers. Here are two more poems by Mr. Louis Emanuel during this period of recognition to our Silver ancestors. Crisscrossing the isthmus, since then until now. Many perished, escaped, hid, who knows. The trains are rolling, right round’ the bend. Steam engine in tow, and passenger cars for all. Thus I ponder, why such things had to pass. The leisure cars can be pricey, so I have been told. behind their wives, mothers children, and loved ones. I am with child, which he is soon to know. As a last resort, is shrouding his plans. To greet our firstborn, honey, let it be. I prayed Lord, please bring them back. The days seems as years, since he’s gone. Dynamite explosion, many Diggers killed. To bless, comfort him, with thy eternal love. This entry was posted in Panama Canal, Panama Rail Road, Silver People, West Indian Panamanian Literature and tagged Centennial Anniversary of the Opening of the Panama Canal, Panamanian Poetry, Panamanian West Indian writers, West Indian Panamanian poets. Bookmark the permalink.